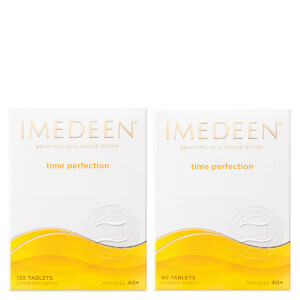 Imedeen Time Perfection 6 Month Bundle helps to combat visible signs of ageing. 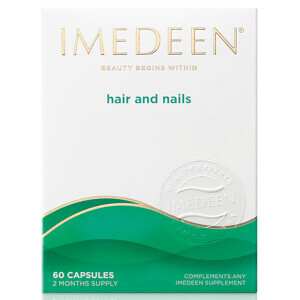 The skincare tablets feature the exclusive Marine Complex that is rich in proteins and polysaccharides that are similar to those found in the skin's supporting tissue. 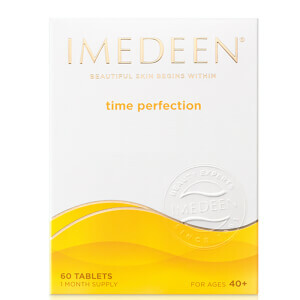 The tablets work in the deep dermal layer where traditional anti-aging creams can't reach. Taken daily, the skincare tablets will help improve the skin quality and moisture balance to make skin on the face and body feel softer, smoother and more supple in just 6 months. Specially formulated for those aged 40 and over. Please Note: Each pack contains 2 months' supply of tablets. May help improve skin quality and moisture balance. 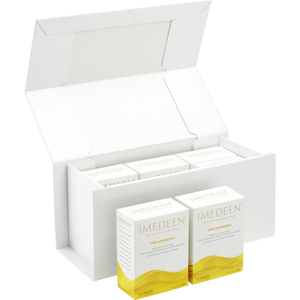 Supports and may protect cells from oxidative stress. Contains LycoPhence GS Forte, Marin Complex, Vitamin C and Zinc.